Every year, the first grade classes study a unit on community, and read the book Roxaboxen by Alice McLerran. Students create a community building or business out of shoe boxes based off of the book. Prior to starting their town project this year, the first grade team came to me to brainstorm ways to make their Roxaboxen community more interactive and to help bring it into the 21st century, while still sticking to the core ideas of the book. We decided to do this through the use of QR codes. After the students had completed the process in the Makerspace of taking a regular old shoe box and turning it into a donut shop, a police station, or a doctor’s office, they then worked on a way to promote their business. Mrs. Myer’s class wrote scripts describing their business, their moveable part, and some of the main features of their building. They practiced their scripts with their peers, and then we recorded them with iPads. Mrs. Yoder’s class designed and published advertisement signs during Writer’s Workshop to promote their businesses. Both the videos and signs were converted into QR codes and placed onto the students’ buildings. 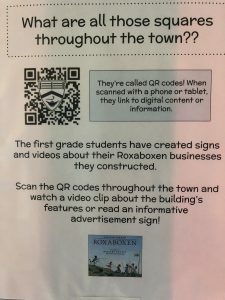 These QR codes allow the Roxaboxen town visitors to scan the codes and either watch that business’s video or read their advertisement sign. The addition of the QR codes is an innovative way to elevate a project that has been a staple of the Powhatan community for years.